Саундтрек к фильму "Дураки". В ролях JASON ROBARDS, KATHARINE ROSS. 1970 Reprise Records original pressing, made in USA. Composed and Conducted by SHORTY ROGERS. 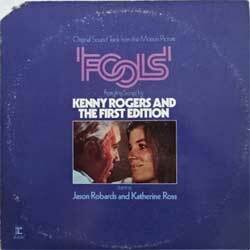 Tracks: Side 1: KENNY ROGERS AND THE FIRST EDITION - A Poem I Wrote For Your Hair (Main Title), KENNY ROGERS - Someone Who Cares, MIMI FARINA and KATHARINE ROSS - If You Love, KENNY ROGERS AND THE FIRST EDITION - A Poem I Wrote For Your Hair (Zoo Montage), KENNY ROGERS AND THE FIRST EDITION - Someone Who Cares; Side 2: Instrumentals: SHORTY ROGERS - Anais & Mathew, SHORTY ROGERS - Up Yours, SHORTY ROGERS - Old Time Movies, SHORTY ROGERS - Take A Walk, SHORTY ROGERS - Cajun Source, SHORTY ROGERS - Someone Who Cares. Состояние винил отличное-, конверт очень хорошее+.